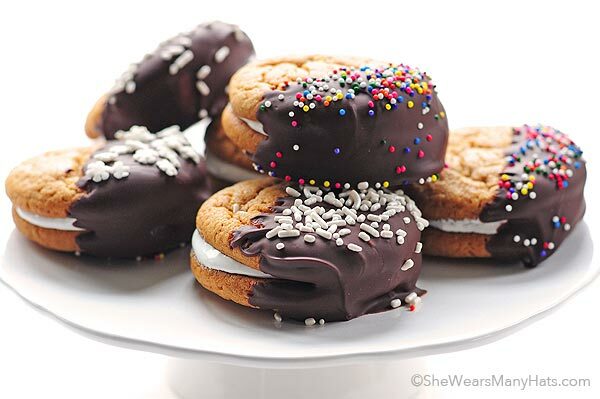 These Marshmallow Creme Filled Chocolate Dipped Sandwich Cookies are super simple way to use basic cookie dough to create a fun and festive cookie sandwich that the kids will love! Holiday cookies can sometimes be intimidating especially when you have little time to prepare something extra special. But it doesn’t have to be difficult. The nice folks from Pillsbury invited me, along with several bloggers, to create some great new cookie recipes for the holidays. 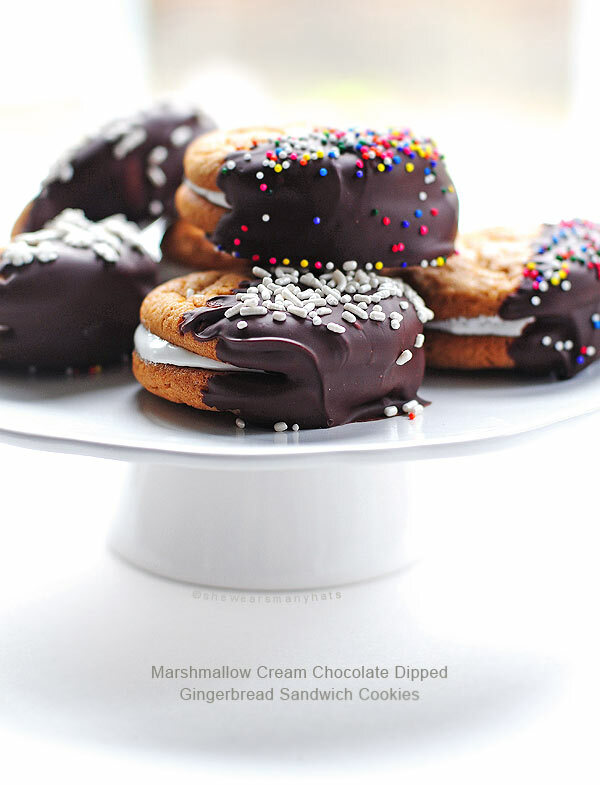 I took the opportunity to enlist our teenage daughter to help create these Marshmallow Creme Filled Chocolate Dipped Sandwich Cookies. They were easy and fun. Although they may look at little complicated, they’re quite simple. Really! The most difficult (if you can call it difficult) thing is planning extra time for chilling in between steps. We used Pillsbury Peanut Butter Cookie Dough for the cookies, but I’m keeping my eyes out for the Pillsbury Gingerbread Cookie Dough to use for these next time. Wouldn’t gingerbread, marshmallow and chocolate be fantastic for the holidays? Or the Pillsbury Peppermint Sugar Cookie Dough? Either of them would be incredible, for sure! Let me explain to you how easy these cookies sandwiches are. Begin by rolling the cookie dough into about 1 tablespoon sized balls. Make sure to keep them uniform so that the sandwich cookies will match up when you assemble them later. Bake them according to the packaging directions and let them cool completely. Melt chocolate, get your marshmallow fluff ready, as well as any sprinkles or decorations you’d like to use. We used a variety of sprinkles, but chopped nuts chopped or crushed candies would be great too. 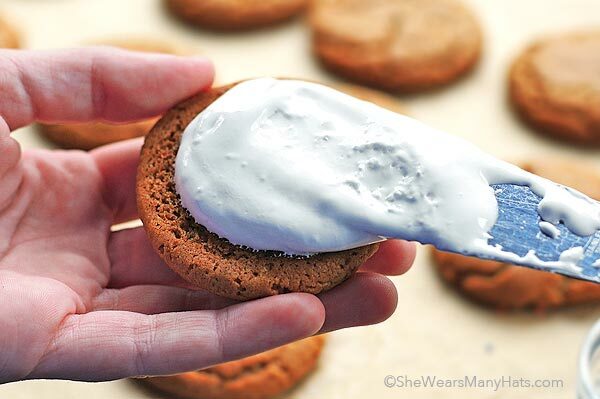 Once cookies have cooled spread a little bit of marshmallow fluff between on a cookie and top it with another cookie to create a cookie sandwich. Next—this is important—chill them in the refrigerator for about 10 to 15 minutes to let the marshmallow cream firm up before dipping them into the melted chocolate. 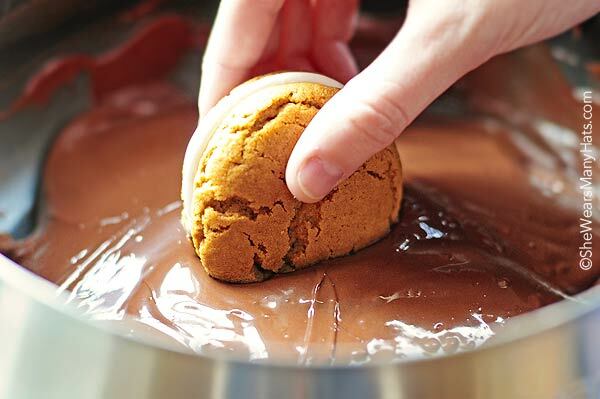 Once chilled, dip one half of the sandwich cookie into the melted chocolate and place on a parchment or wax paper lined baking sheet and sprinkle with your favorites goodies. Time for more chilling! Place the cookie filled baking sheet, lightly covered, back into the refrigerator for the chocolate to harden. You can leave them in the refrigerator until you’re ready to serve. If you’d like, transfer cookies to a plastic container or plastic ziptop bag and store in the refrigerator until ready to serve. If left at room temperature for too long (maybe an hour or so? ), the marshmallow cream will begin to get gooey and spread. These were crazy good! And not only did they turn out totally tasty, but they were fun to make. I can see setting all the makings for these out for our teenagers the next time they have friends over to have a cookie making party. The combinations could be really fun! 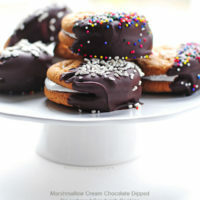 These Marshmallow Creme Filled Chocolate Dipped Sandwich Cookies are such a special treat to make for the holidays. And they're easy too! Form 48 cookie dough balls, about 1 tablespoon rounds. Make sure to keep them uniform so that the sandwich cookies will match up when you assemble them later. Bake on parchment lined baking sheet for 12-14 minutes, and let cool completely. 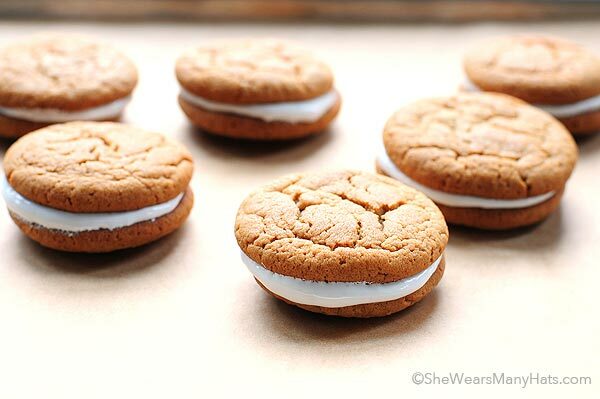 Spread a little bit of marshmallow fluff on a cookie and top it with another cookie to create a cookie sandwich. Chill cookie sandwiches in refrigerator for about 10 to 15 minutes to let the marshmallow cream firm up before dipping them into melted chocolate. 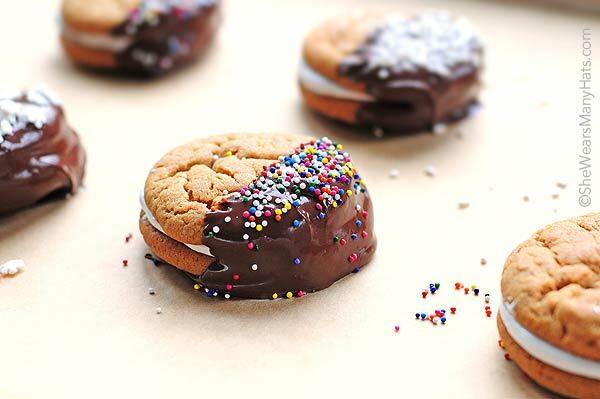 Place chocolate dipped sandwich cookies back in the refrigerator to chill until chocolate hardens. Store covered and refrigerated (or in cool place) ready to serve. You had me at M.
Holy moly! I am sold! These look amazing! 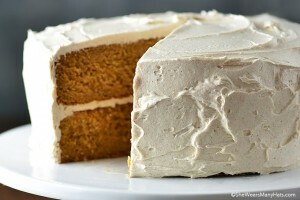 Gingerbread would be awesome!! These are so lovely, Amy!! Wowzer. I want these so badly!